Age 87, passed away October 1st early in the morning at her home surrounded by loving family members. A private memorial ceremony will be held by family members in the coming months. 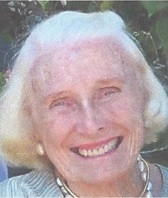 Her husband of 54 years, Everett Chipman Higgins (Chip) passed away in Honolulu in 2004. She was born in Cleveland, Ohio, the eldest of three children. She attended Hood College and then married Chip, a graduate of the Naval Academy. She lived in many places as the wife of a Naval officer, but has lived in Honolulu for the past 46 years. She is survived by her brother Bard McLean, her daughters Marjorie Higgins Nailor and Neal Higgins Walters; her son Ronald DeWolf Higgins; six grandchildren and eight great grandchildren. Barbara had lifelong interests in the arts, in American history, and in gardening. She was a docent at the Philadelphia Museum of Art, the Corcoran Gallery and her beloved Honolulu Museum of Art specializing in modern art. She was past President of the Colonial Dames of Hawaii, and a long time Regent of the Kenmore Plantation and The George Washington Foundation in Fredericksburg, Virginia. These foundations have preserved the boyhood home of George Washington and the home of his sister Betty Washington Lewis. She was an active member of the Garden Club of Honolulu and the Garden Club of America where she served on multiple executive committees including the Executive Board. She received the 1990 Garden Club of America Conservation Award. She was also a long time member of the Outrigger Canoe Club and the Oahu Country Club. However, her greatest interest was in her family. She sponsored family reunions in many places in the United States and Europe; and hosted many family gatherings in Honolulu during the summer and during Christmas vacations. She has passed on her love of the arts, American history, and gardening to her children and grandchildren. She is missed and will be missed, but will live in the hearts of her family and friends. To express condolences and/or make a donation in her honor: Honolulu Museum of Art, 900 So. Beretania St., Honolulu, HI 96814 or The George Washington Foundation, 1201 Washington Ave., Fredericksburg, VA 23401.